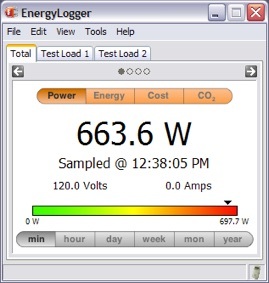 EnergyLogger is a free, native Windows application designed to log real-time energy usage from the “Tweet-A-Watt”, a wirelessly enhanced version of the ubiquitous Kill-A-Watt power meter. The Tweet-A-Watt project was Make Magazine’s winning entry into the 2009 Greener Gadgets Design Competition sponsored by Core77 and the Greener Gadgets conference. The meter can be built very inexpensively, including the cost of the Kill-A-Watt itself and the kit needed to turn it into a wireless mesh transmitter. The project was published as “open-source hardware”, and has been built by numerous energy conscious makers around the world. EnergyLogger is designed to take the place of the Python scripts developed for the original Tweet-A-Watt project. By providing a user-friendly GUI interface for monitoring and logging data from these wireless enabled meters, we hope to remove one of the barriers to entry when implementing this project for yourself. EnergyLogger 2.0 adds the ability to measure and predict your electric costs and even your carbon footprint (CO₂ production), based on the latest data from the Environmental Protection Agency and the Department of Energy. •Log data to Pachube, a web based service which handles millions of sensor data points every day (you can see data for our office server here). •Log data to the new Google PowerMeter web service. •and “Tweet” these alarms to a user’s Twitter account. The data files created by EnergyLogger can be imported directly into EnergyProbe, our flagship energy analysis software delivering an inexpensive, powerful, wireless solution to record, understand and interpret energy usage which had previously cost many thousands of dollars. 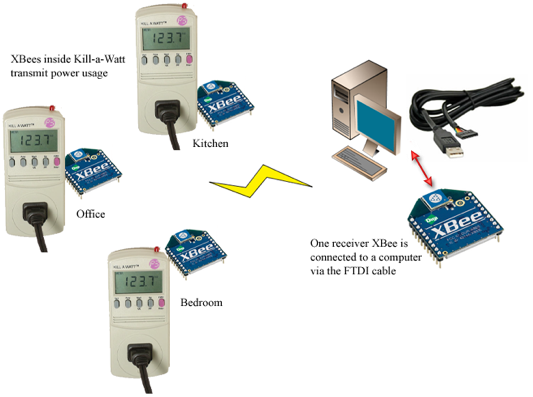 The 802.15 wireless standard implemented in the XBee radios allows EnergyLogger to monitor multiple Kill-A-Watt meters simultaneously. Data is collected approximately every 2 seconds, processed, logged and uploaded at user defined intervals. The interface is simple to navigate, provides all the pertinent information at a glance and can be made to disappear into the system tray or menu bar, doing it’s job in the background while your computer is free to do other tasks. Click here to view more EnergyLogger screenshots. EnergyLogger is distributed as free for non-commercial use (EULA). If you are interested in incorporating EnergyLogger into a commercial product, or would like to use it in a commercial setting, please contact us to arrange a licensing agreement. EnergyLogger™ can be downloaded on the Downloads page.